Lawns should be raked of the last of the leaves and paths and terraces swept. Toppled bean tripods and collapsed perennials can bring down the tone in the beds. Salvage canes and store them in a dry shed to prevent them from rotting. Edit back to the perennials that will provide with wintery skeletons. Leaving as much as you can in the beds is good for the balance of the garden and will save you time for more pressing tasks. Although it doesn’t always happen, I aspire to get woody plants into the ground before the year is out to make the most of the warmth still held there. Bare-root plants must be kept hydrated when you are planting, so keep them in a plastic bag or dip them in a bucket of water. 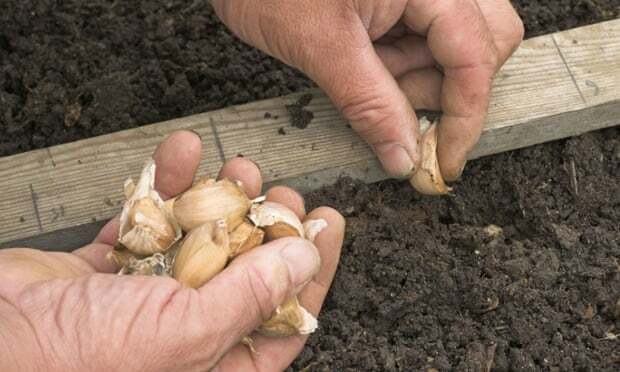 If you have not done so already and if the weather stays mild, plant garlic. The same goes for autumn shallots and onions, which can be planted as sets to grow over the winter. Given a well-drained position they are perfectly hardy, with new growth and roots pushing against the tide of this season to make a rapid getaway in the spring. I will plant another batch in April so I have a later crop and a longer season of onions for the kitchen. Prune autumn-fruiting raspberries to the base and remove any runners that might be advancing beyond your limits. The parent canes should last a good five to seven years before they need replacing, but if your old canes are diminishing in strength take this opportunity to start afresh. Choose fresh ground to avoid disease. If you have the luxury of space, allow a year for the new plants to get established before you remove the old. Raspberries like a friable root run, so mulch the soil and improve it with compost. As soon as the leaves are down, prune red and white currants by tipping this year’s leaders and shortening laterals to three or four buds. Keep older plants in good condition by removing a quarter of the eldest limbs. Use prunings for hardwood cuttings. Currant, honeysuckle, buddleia, cornus, willow and vine are all easily increased as soon as the foliage is down. Take a pencil-thick section 6in long. Cut below a bud at the bottom and above one at the top with a sloping cut. Insert the cutting into a trench or a pot and leave to root over the winter. I started gardening after witnessing the alchemy of a hippeastrum coming to life, and I like to regularly repeat the experience to inject some winter colour. Pot up in terracotta and a loam-based compost with half the bulb exposed. Keep lightly watered until you see signs of growth and keep on a sunny windowsill.